In destroying Lord Regret, however, they weren’t able to fully heal the wound he created in the world’s magic. The last of the Wardens to die hoped that the absence of their magic would provide the final healing prompt. But it seems not; and the evil is beginning to spread again. Soon the Wardens find themselves returned – as much to their surprise as to that of everyone else. Have they been brought back to finish the healing? Or are they another ominous sign of the spreading evil? Certainly, the conflicts between them have not eased with their long absence from the world. Almost before they have time to draw breath, the Wardens are battling both Lord Regret’s legacy and each other – and it’s not clear which is the greatest danger. There are some small problems with the novel – for example, one chapter I found a little confusing, as it seemed to be a flashback but it was just kind of dropped into the middle of the story in a way that meant I initially read it as a short jump FORWARD in time, not back. Even now I’m a little uncertain that I could really put my finger on where it belongs sequentially. While there were other flashbacks in the novel – generally used to good effect to tell us a little more about character or history – this was the only one I found confusing. This chapter could have benefited from a few sentences to anchor it in the time sequence. Some readers may also be bothered by the fact that we learn very little about some of the Wardens. I wasn’t overly concerned by this; Bowring focuses on those who are most important to his story. He introduces the Wardens gradually, and their backgrounds in bits and pieces in a way that makes it very interesting and not just long interludes of infodump. As such, it makes sense to me that not all the Wardens get equal time. Any other approach could have wound up with a rather rote feel: “And now we will spend three pages introducing Warden number three…”. It may well be that we learn more about other Wardens in the sequels, but it certainly didn’t feel necessary to the story so far. The characterisation was strong and the main characters came to life quickly. Because Bowring introduces information about the characters gradually, it genuinely feels like getting to know a new acquaintance. After all, few people sit down and tell you all about themselves and their past the moment they meet you; you usually find things out over time. This also enables Bowring to introduce a few surprises without feeling contrived, and keeps the reader curious to find out about things that are hinted at early on but not explained until later. It’s an effective technique for both characterisation and plotting, and Bowring uses it exceptionally well. And the plot is interesting. Initially I wasn’t sure if this trilogy is a sequel to an earlier one. Bowring launches into his plot and characters in an immediate fashion, which means an initial sense that he is assuming the reader knows certain things. This adds a kind of reality to the novel – as though you’ve just walked into the middle of these people’s lives – and again helps to keep the reader engaged as you try to figure out certain references. I’m still not sure if this is a sequel; enough information is given through the novel that it really doesn’t matter whether it is or not. Past events which influence what’s happening in the “now” of the novel are eventually spelled out quite clearly through simple techniques such as flashbacks and conversation. The structure of the plot is relatively familiar – a “let’s save the world” quest. However, Bowring has worked out a credible system of magic and worldbuilding with some unusual twists, combined this with some tension and strong characterisations, and developed a plot which will keep readers genuinely interested. There are a few surprises, and a number of significant events throughout the novel. There isn’t a strong sense of resolution – almost everything is still to be continued in the next novel – but there is a sense that the novel has “paused” at an appropriate spot. And there is also a sense that the plot has advanced significantly; despite the amount of set up required, Bowring has also managed to have his characters get quite a lot done. 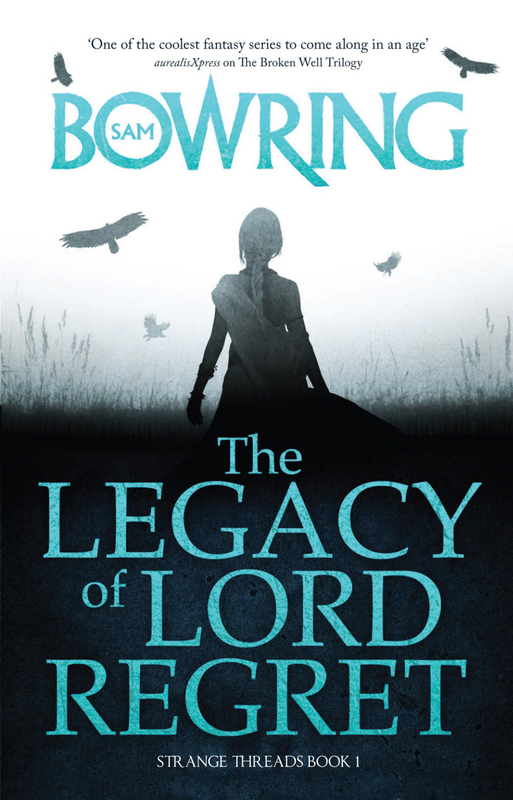 The Legacy of Lord Regret is a genuinely entertaining novel which is likely to be enjoyed by a wide readership, though perhaps most likely by those inclined towards the fantasy genre. The novel has a lot of strengths, which help to widen its appeal. It will leave readers keen to get their hands on the next instalment, and has left me interested to find other work by Bowring.